A Programme and Souvenir booklet will be produced for all registered Sir Knights and Candidates, similar to be booklets produced for previous exemplifications. 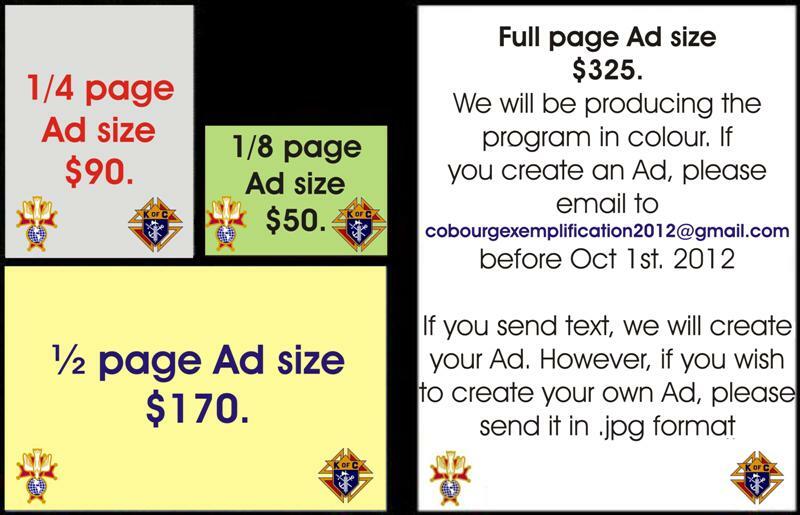 We invite you to purchase an advertisement in the Exemplification 2012 Booklet and draw your attention to the various ad sizes and prices on the attached page. Please note the advertisement; text, graphics and/or photograph will be sized to fit the sponsorship level purchased. We would ask that you please mention to your members, that individuals can be listed as patrons of the Exemplification and have their names and Council number published in the booklet (listed alphabetically). The cost for this is a modest $3.00 and is a nice way to honour our Candidates and Sir Knights. Your ad/ photograph can be sent electronically to cobourgexemplification2012@gmail.com.